Most of us will never understand the full magnitude or impact of the life or death decisions that first responders make for strangers on a daily basis. But that wiring through their compassionate souls is exactly what makes first responders so unique. None of these men and women even consider the risk. Instead, they just do what it takes to save lives. September 11, 2001 was the ultimate example of the heartbeat of first responders. 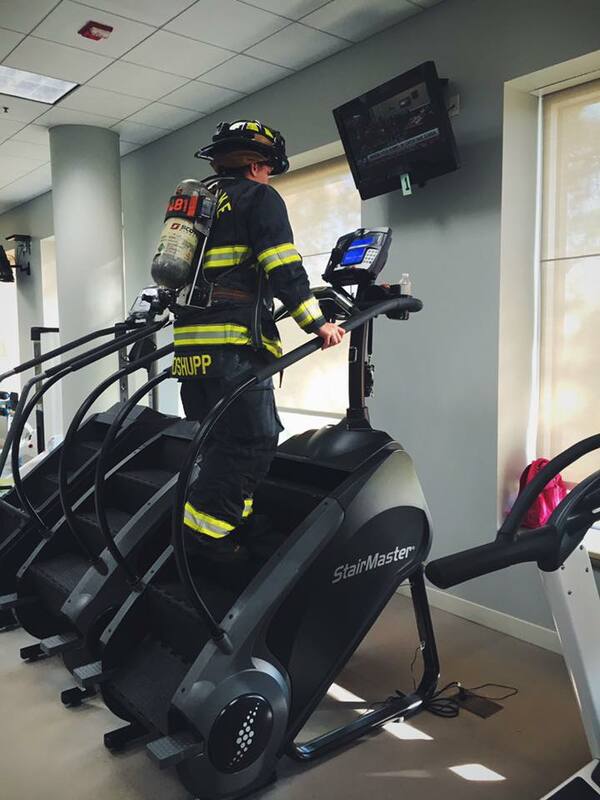 Today, Westlake Firefighter Shupp put on his 50 pounds of gear and walked 110 flights on the StairMaster to honor the fallen heroes of 9/11. It was not easy. 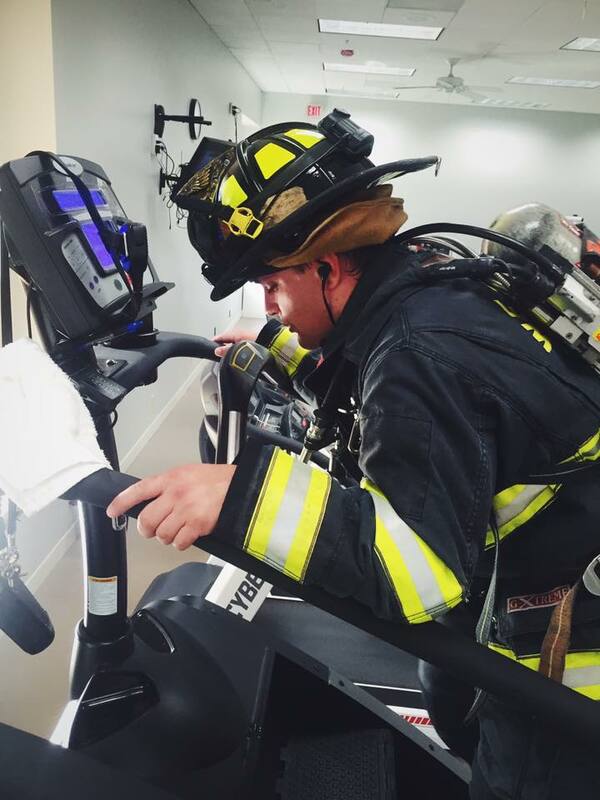 He had to push through on a variety of moments, but he fought through the weakness of his body to commemorate his fallen brothers replicating what these men and women did on 9/11 for so many strangers. What an honor it was this morning to have seen this young man with such a passionate heart show his respect to those who made the utmost sacrifice 15 years ago. 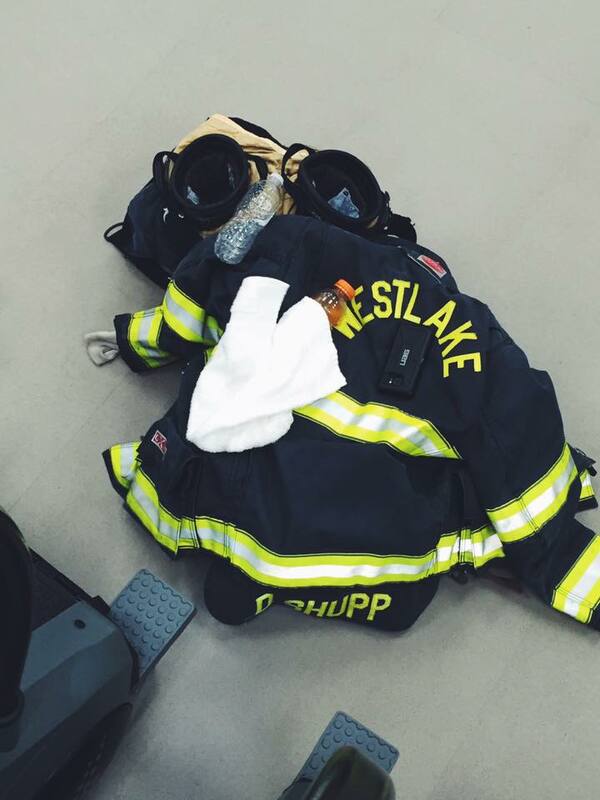 Firefighter Shupp sure does represent the Westlake Fire Department and Town of Westlake well. Thank you. One of the trainers at the gym walked over and asked permission to record him for a couple seconds with him explaining what he was doing (normal for Shane, ha). On Tuesday I showed up at the gym for my routine work out, which always includes the stair stepper in some form or fashion. When I walked up the stairs, before I could notice anything else, I saw a Westlake firefighter in his full gear standing atop the machine. The Westlake FD works out our gym and we see them almost every time we are there, so it's not unusual to see a fireman. It is, however, very unusual to see one in their gear. I stood there for a bit wondering if I should skip the stair stepper as to not disturb him or would he like the company? I walked over to that area, put down my backpack, still not knowing what I should do. I am not sure how or when I made the decision to go for it, but seconds later, I found myself next to him rooting him on. It was such an odd moment for me. I was so proud of him next to me, seeing him literally fight when it became impossible. While we have worked out at the same gym for four years and I have met him before, we are mere acquaintances. He is a quiet man. I believe he is a bit young as well. He missed the deadline to do the commemorative 9/11 stair climb in Dallas, so this was his own personal tribute. He did it for no personal gain at all. That was clear and obvious. His humility made it even more special. It was also a moment where I have never felt so insignificant in my life. I was there just doing my normal for me. He was there doing the impossible for others. Sharing the good in this world is simply not done enough.